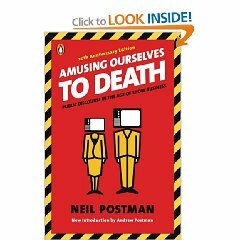 In my persuasion class this quarter we read a novel by Neil Postman called Amusing Ourselves to Death. It examines how television has shaped society and affected our outlook. The book was written in 1985. I won’t lie, when I realized this I was automatically uninterested in Postman’s message. I was annoyed that my class wasn’t focusing on up and coming trends or reading novels that explored the digital age of communication. Television felt like a topic of past. The telegraph is suited only to the flashing of messages, each to be quickly replaced by a more up-to-date message. Facts push other facts into and then out of consciousness at speeds that neither permit nor require evaluation. The telegraph introduced a kind of public conversation whose form had starting characteristics: Its language was the language of headlines–sensational, fragmented, impersonal. News took the form of slogans, to be noted with excitement, to be forgotten with dispatch. Its language was also entirely discontinuous. One message had no connection to that which preceded or followed it. Each “headline” stood alone as its own context. Wow…this was supposed to be a description of the telegraph? I could have sworn this was the bio written for everyone’s favorite micoblogging site, Twitter. My silly, little, undergrad mind was amazed. It feels like the modes of communication and technology change every day, but perhaps certain ideas change less than I think. I’m in the middle of reading Chris Brogan’s book Trust Agents, and was able to pull some of his thoughts into my report. Two novels with connecting ideas and 25 years between them, I love that. I like making those connections, realizing the value of my education in my classes and seeing how I can apply it. If you haven’t read Amusing Oursevles to Death, I recommend it. If you have read it, what did you think?